We have finally arrived in India, probably the most diverse, enchanting, terrifying, dirty, beautiful, colorful country on earth. Adjectives don't do it justice, because they can't really describe it. It is really a land of contrasts. It has amazing architecture, and amazingly awful slums. Beautiful sunsets, enhanced by air so dirty it hurts to breathe. Wonderfully open and friendly people, and some of the worst crooks you could imagine. I started by seeing the city of Kochi (formerly Cochin) in the state of Kerala, an area I had not been in before. This is where Vasco de Gama landed when he made the first sea voyage from Europe in 1498, thus finding the elusive sea route to the Indies previously sought by Christopher Columbus and others. The Portuguese were able to establish a colony here but were subsequently kicked out by the Dutch and the British. My first stop was Matancherry Palace, built by the Portuguese for the Maharajah in 1555. Jews had established a trading post north of there in Goa 2000 years ago but were being slaughtered by the Portuguese, who brought the Inquisition with them. The Maharajah protected them by giving them permission to build a synagogue next door to the palace, which still stands and is the oldest synagogue in the British Commonwealth. Most of the Jews emigrated to Israel in 1949. There are only eight left, known as "white Jews," and they own the synagogue, which still functions. There are about 70 "black Jews," or mixed race descendants, who also attend services there. Nearby is the Police Museum, which is mostly a display of historical weapons and uniforms used by the local police force. I went to the nearby spice market and purchased some saffron. I haven't had my own kitchen in two years and am looking forward to some experimenting. Next I went to St Francis Church, the oldest European church in India. 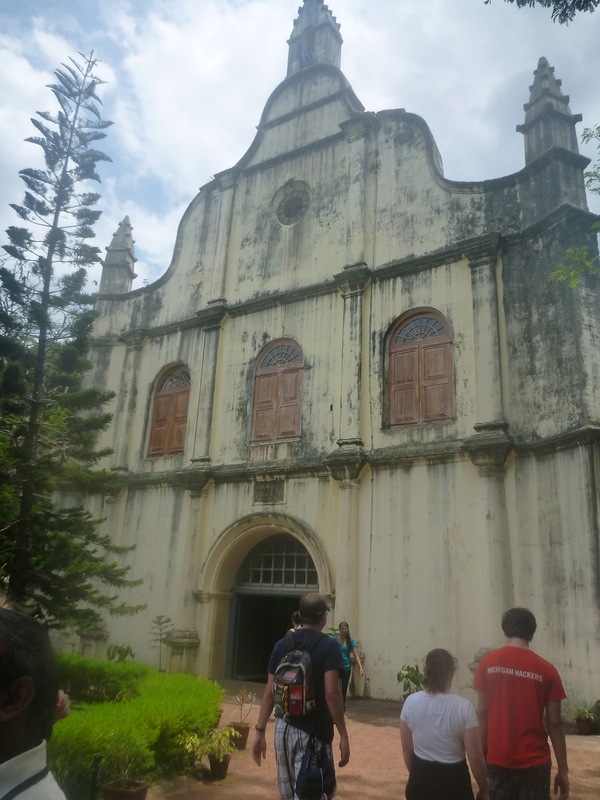 My guide said Vasco de Gama died in Goa and his son brought the remains to the church to be buried.. There is a tomb with his name on it. According to Wikipedia, Vasco de Gama did die in India, but his son came and took his remains back to Portugual, where he was buried in style. An interesting thing about the church is the punkah fans above the rows of seats, with holes in the walls for servants to operate the levers from outside. The church was changed from Catholic to Anglican in 1800 after the British took control of the area. In 1997 Queen Elizabeth attended a ceremony there to honor 50 years of Indian independence. The other interesting things I saw were the fishing nets at Fort Cochin. Apparently Kublai Khan (think Marco Polo) sent fishermen there in the 13th century and the locals still use their system of large nets on a wooden platform. They call them Chinese fishing nets but I only saw Indians around.